You know when you make a grilled cheese (or toastie as we call it back home) and the cheese oozes out into the pan then it gets browned and crispy? It gets all nutty and good and you find yourself sneaking the good bits? This might just be, the best ever grilled cheese sandwich. Dare I call it gourmet? Ok, I wont push my luck. 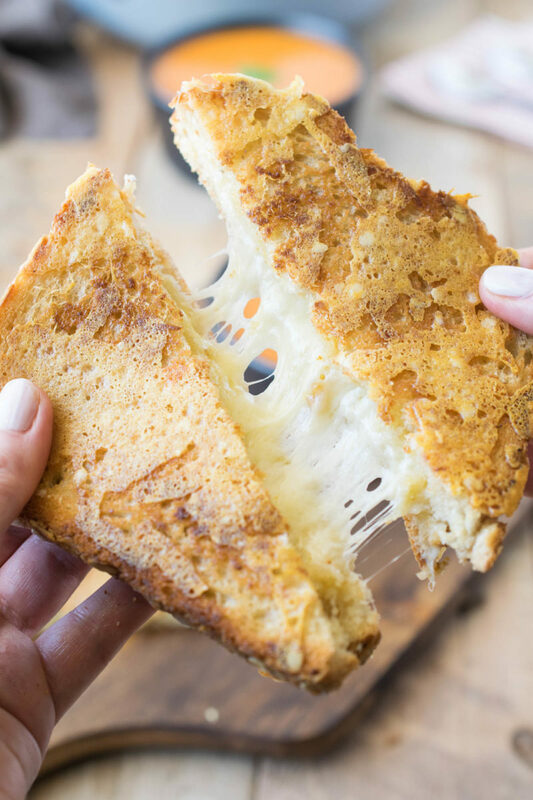 This sandwich has THAT crispy, nutty cheese on the outside of the bread as well as all the amazing melty cheese inside and it’s oh so crispy. Have you ever had a parmesan crisp/frico? Grated parmesan is melted in a pan and it gets crispy and nutty. What is the best bread for a grilled cheese sandwich? I would say any sliced bread that you like. Multigrain is good for flavor and sourdough is always a favorite. The combinations you could use are endless. If it is a good melting cheese, then it can be used. 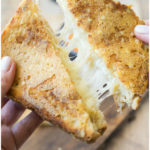 I used a combination of sharp white cheddar and gruyere because they are 2 of my favorites and they make for a flavorful combination, but the ultimate choice is yours. Don’t think that I’ve forgotten the best friend that goes with a grilled cheese sandwich. Earlier this week I made 30 minute tomato basil soup. This soup is so easy and is made with fresh tomatoes to get the best flavor possible. Get the recipe here >> recipe. 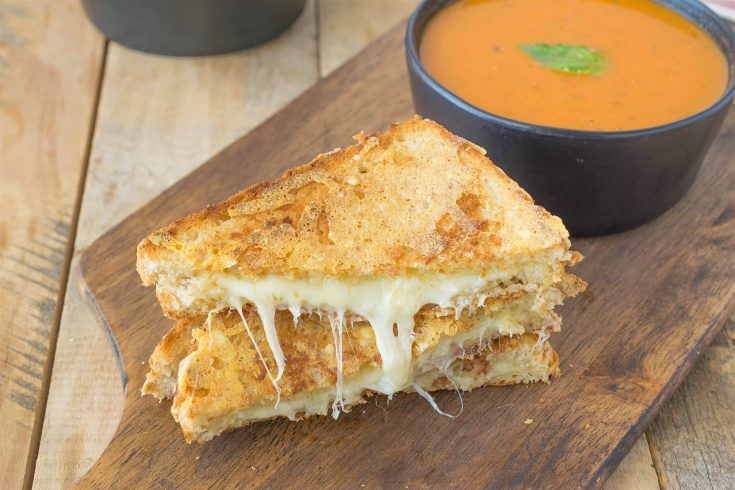 If you’ve tried this Triple Grilled Cheese or any other recipe on the blog then don’t forget to rate the recipe and let me know how you got on in the comments below. I love to hear from my readers! You can also FOLLOW ME on FACEBOOK, TWITTER, INSTAGRAM and PINTEREST to see daily recipe updates. Parmesan, gryuyere and cheddar. Two cheeses on the inside of the bread and one cheese on the outside for the tastiest, cheesiest grilled cheese. Preheat a large, non-stick skillet or grill pan over medium heat. Lay all the slices of bread out and spread the tops evenly with the butter. Heat a large, non-stick skillet over medium low heat. Place 1 slice of bread into the pan butter-side down. Top with 1/4 cup gruyere and 1/4 cup cheddar, lay a slice of bread on top, and lightly spread butter on the top. Tent loosely with foil and cook for 2 minutes until the underside starts to brown. Flip the sandwich over and sprinkle 1 tablespoon parmesan cheese on the top. Tent with foil and cook for 2 minutes until the underside is browned then flip the sandwich. Sprinkle the top with 1 tablespoon parmesan cheese, tent with foil and cook for 2 minutes until the underside is brown. Flip one last time and cook for 2 minutes until the underside is browned. Repeat with all sandwiches or you can try and fit as many into the pan at the same time if it is big enough. Great idea. How cool it is, tripple grilled cheese. I like this recipe. Your instruction is very detail. Will try to make this. 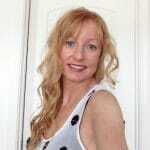 Thanks for sharing, Janette. all the kids love this i’m sure. 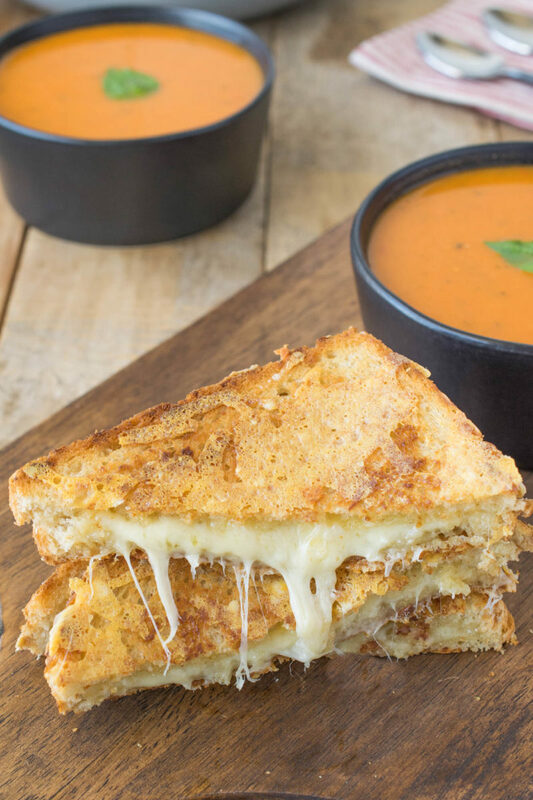 😀 tomato soup is the only one that could be combined with this triple grilled cheese. nice recipe, thanks for sharing, Janette. this looks tasty. my kids love the melted cheese so much. I must try this out. it’s gonna be a great breakfast for them. thanks for sharing this. This looks perfect! Love the melted cheese, can’t wait to try it! I just made a grilled cheese/ tomato soup combo the other day! Great minds think alike 🙂 Mo’ cheese, mo’ better! I’m loving this 3 cheese combo, Janette! I’ll take a few of those, if you don’t mind. Gimmmmmmeeeeeee. Man, I haven’t had grilled cheese in AGES and now I need one. Love this recipe! Adding Parmesan cheese sounds so good! Oh that looks so amazingly good. I love melted and crispy cheese so much. Love it. Love how you’ve added the extra crunch to this the triple cheese griller. It kills me to see it being dunked into the tomato soup and not have my mouth there to help out! Wow – cheese on the outside too!? I wouldn’t call it a dark side — rather, a SUPER delicious side! 😉 Great recipe!